I have a 91 Mercury Grand Marquis with 80K on the 302 engine. I previously had an 80 Crown Vic 302 where the timing chain jumped a tooth, but was never fixed. My neighbor had the same experience with his F150. I believe my engine may have a timing chain set up where the sprocket teeth are made from nylon and are prone to wearing out. Some searching shows Ford switched from nylon to all steel some time between 87 and 93. Can someone verify if my 91 has the nylon gears? How long can I expect the sprockets to last before they need replacement? I'm posting in the Mustang forum because the Crown Vic/Marquis crowd aren't the motorheads who can field such a question. 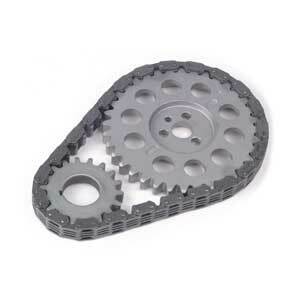 yes, cloyes double roller chains are like 35-40 bucks from summitracing.com, jegs.com, or your local auto parts store. to the best of my knowledge, ford didnt use a nylon gear on the 302's but i may be having a complete brain fart right now.